I don't like teekha food. There I've said it. I mean it. Well, to be honest, what I don't like is the oh-my-god-save-me feeling I get when I have hot food. Food I love. Food I like. With this in mind, accepting an invite to partake in the King of Spices Festival at Le Meridien, Delhi, would be considered sheer madness. But we need to face our fears, and conquering the Bhoot Jolokia chilli, is one of them. 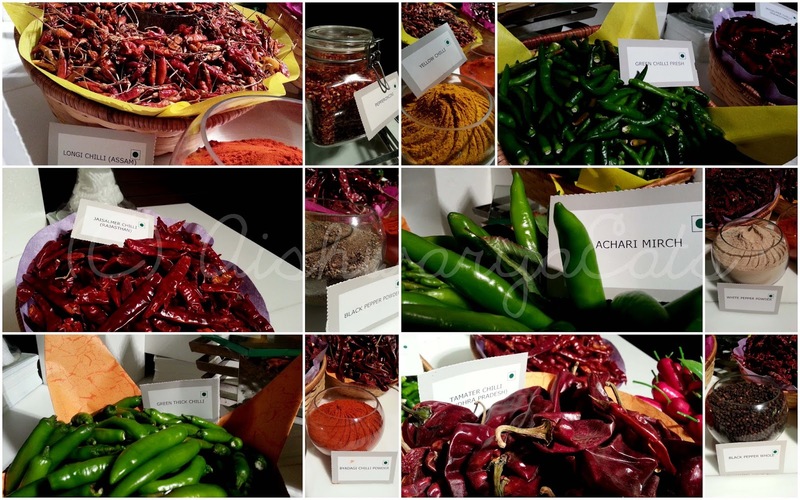 The lobby area in front of eau de Monsoon, the lovely Indian fusion restaurant in Le Meridien had a display of many varieties of chillies, available in India. There was the plain ol' hari mirch, Achaari Mirch, the ones meant to be stuffed and pickled, yellow and Byadagi red chilli powder, Jalapenos, black and white pepper powder, Longi chilli of Assam, Pepperoncini flakes, Tamater chilli of Andhra Pradesh, Jaisalmer Chilli, Thick green chillies that don't have a heat, but has that green flavour of chillies, and of course, the Bhoot Jolokia. 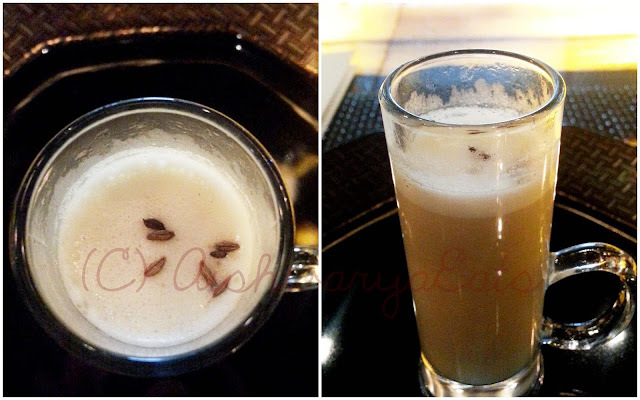 We started off with a Mushroom Capuccino, a shot of creamy mushroom reduction, tempered with jeera, served in a shot-glass sized beer mug. The fun bit? It was warm on the top, and chilled at the bottom! We could clearly taste the woodiness and meatiness of the mushrooms, like Portobellos and Shiitakes. What an amazing amuse-bouche! 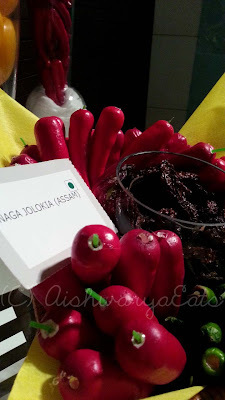 We were served Teen Mirch ka Jhinga for carnivores like Parul and I, which was prawns individually marinated with Bird's Eye Chilli, Byadagi and Black Pepper, with a Saffron Honey Yoghurt dipping sauce. What can I say? I'm a sucker for prawns! 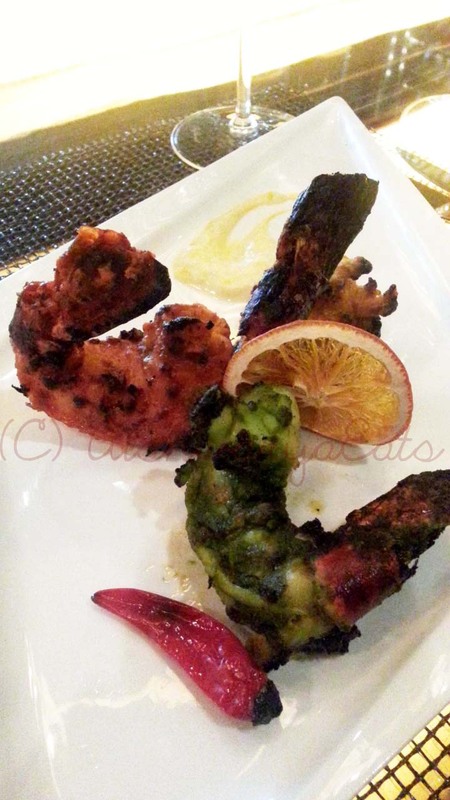 The prawns were crunchy yet maneuverable with a fork and knife, in three truly delicious marinades. Each one was better than the previous one. The flavour of chillies ranged from smoky, to almost pickle like, to straight-hit-the-back-of-your-throat hot! 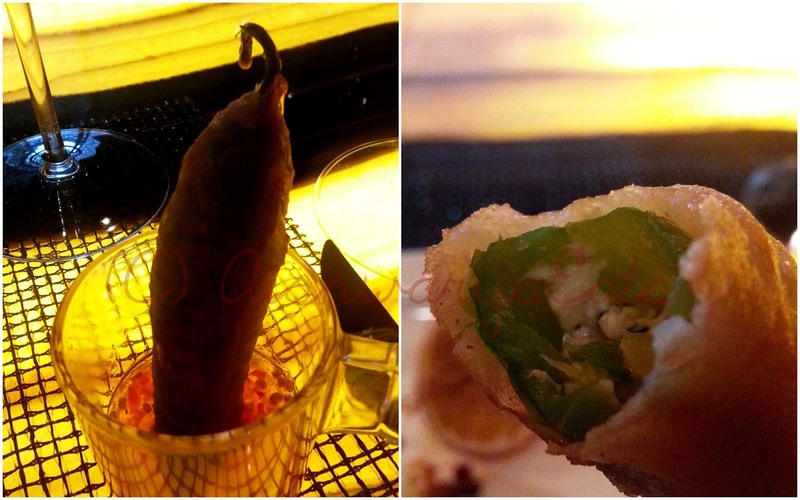 Immediately, we were given even tinier little glasses, layered with a Sweet-Chilli Sauce at the bottom, and a crisp deep-fried Mirchi Bada standing proud on it. This was superlative. In spite of my low teekha-withstanding point, I love Mirchi Badas, especially when in this case it was stuffed with Feta cheese and yellow peppers. With steam still pouring out of it, I wiped the sauce clean with the Bada. We then tasted the Chettinad Pepper Chicken, with a crisp thick, almost cookie-like bread studded with saunf The chicken was soft, and I guess the Chettinad Chicken was good too. What most of us were a little stumped by was the sweetness in the gravy. As also the lack of the typical coconut flavour. While this was amiss, I should say here that the gravy was quite nice on its own. We moved on to the ever popular Lal Maas of Rajasthan. 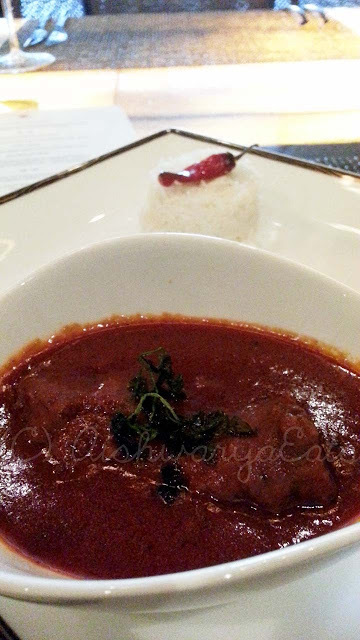 It was served so beautifully with a little bit of rice and a Jaisalmer chilli sitting pretty on it. 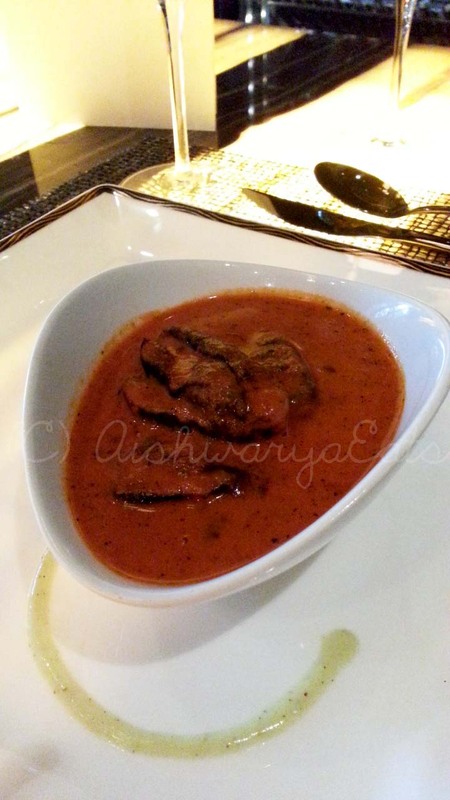 The gravy itself was very piquant, the sweetness of the chilli shining through with smoky heat. 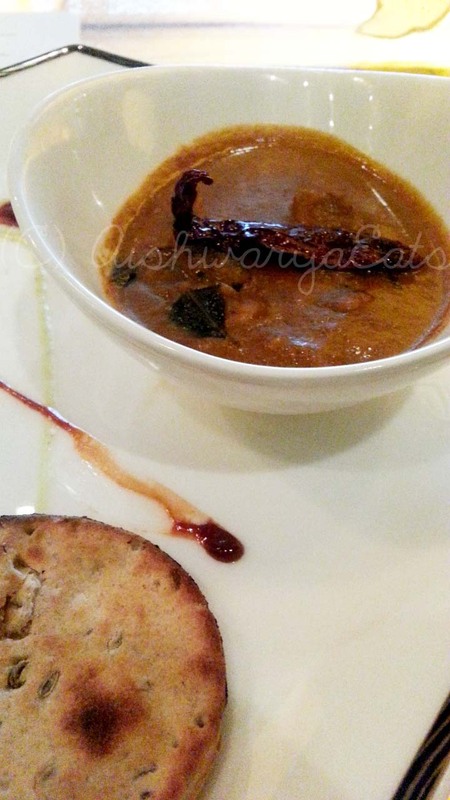 The meat itself was tender and paired beautifully with the small parathas stuffed with Pepperoncini flakes. A very beautiful course! I was rubbing my hands in glee for the next course. It was a Jolokia Jalfrezi, chargrilled prawns, chicken and lamb stir-fried in Mustard oil with the Bhoot Jolokia chilli, Bell-Peppers, Onions and Tomatoes. It came with a soup-spoon laden with cool raita. 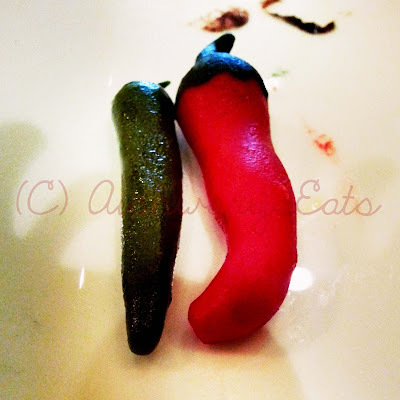 It was truly red in colour and you could taste the rawness of a chilli that means business. The proteins were tender and well-cooked. As excited I was about this, expecting to start crying in the heat, I was a bit disappointed when the famed heat of the Bhoot Jolokia did not really come through. Another problem I had with the dish was the combination of three different proteins in one bowl. I feel with so many proteins, the concentrations gets diverted to coping with the richness and heaviness of the dish. It was well-made, very well-made, no doubt. 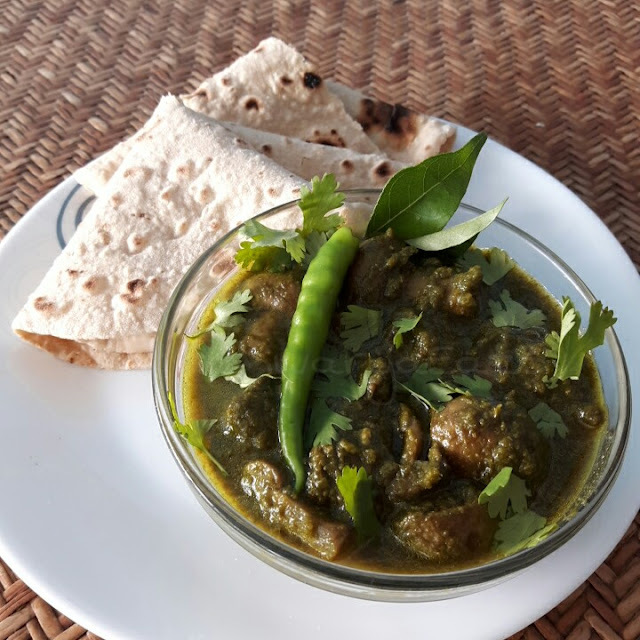 The vegetarians, like our beautiful Rekha were served a Khatta Baingan for this course, which R, my guest for the day, said was tangy and mouth-puckeringly so. As long as it lives up to the name! We had a few palate-cleansers in between courses. There was a Quenelle of Blackberry sorbet, which, while refreshing, it tasted too much of cough syrup. The other one however, after the Jalfrezi, was a Chilled Pineapple Consomme. I could swim in it, it was so good. It tasted of the raw fruit and cooled down the tongue from the Jolokia pepper. All of us wiped it up in silence, and not a drop was left! Dessert time! I was looking forward to this, because chilli being used in savouries was nothing new. In desserts however, I was yet to have one. We were given two platters. One was a Chilli Kalakand on a Pistachio Biscuit and a Bell Pepper Ice cream. The Kalakand was mind-blowing. 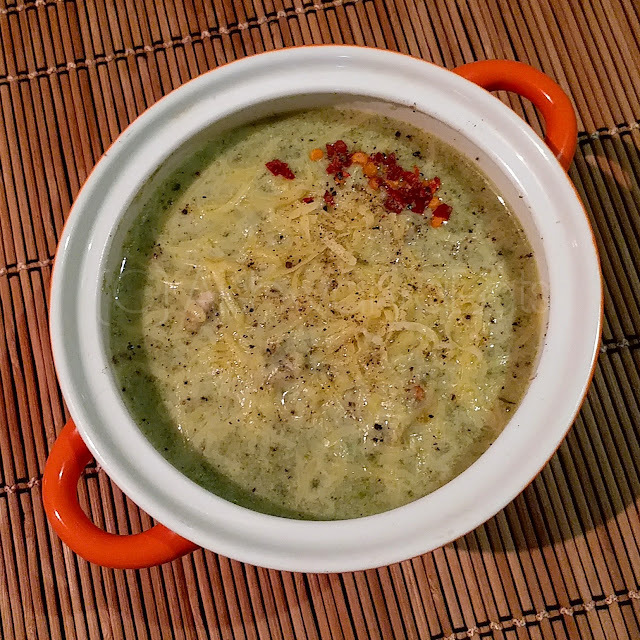 It was reduced milk to that almost solid stage when you'd beg your mother to lick the vessel, with that beautiful fresh green-ness of chillis on a crumbly, almost moist Pistachio Biscuit base. 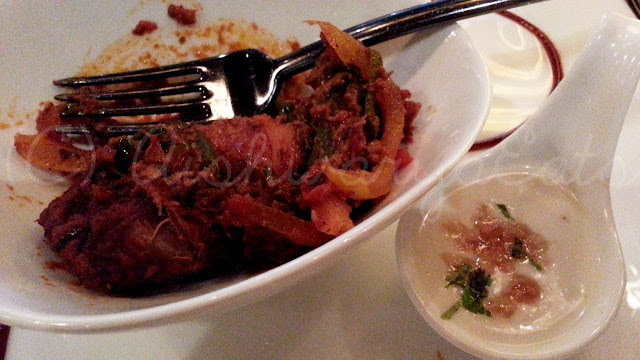 The Bell-pepper ice-cream was so different, I really really liked it. It had that sweetness of a green Bell Pepper, converted into a cold creamy dessert! 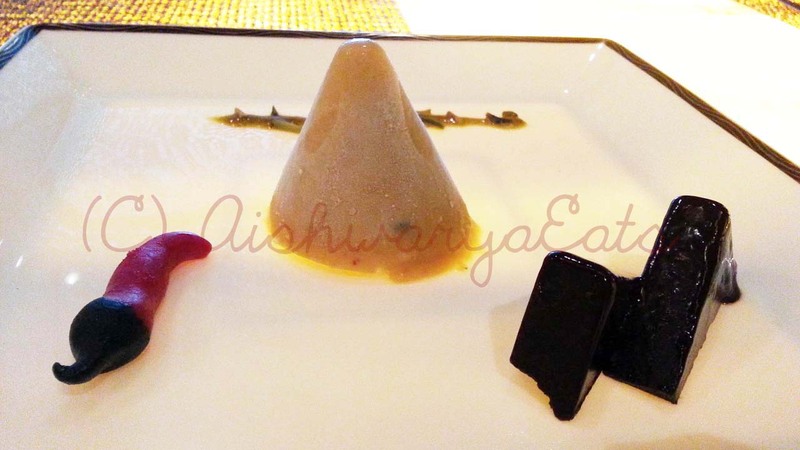 The other platter had Mango Chilli Kulfi with a Pistachio Snow, and a Chocolate Chilli Pave. 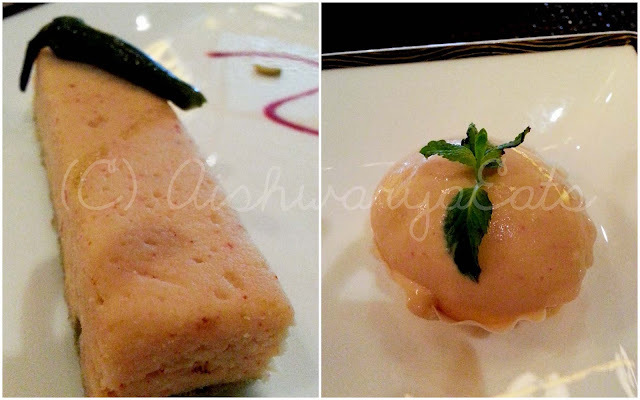 The Kulfi was avoidable, less because of the taste, and more because of a strange grainy texture. It did have a good play on the mango and chilli flavours, but it didn't work out. The Chocolate Chilli Pave in the other hand. Fireworks and celebrations in my mouth for the almost Devil-like combination of Dark chocolate and chilli. It was fudgy, cold and had that kick of chilli and made me want to go to hell, if only Devil served this for dessert. In the dessert platter, as a garnish, there were two chillis. Nope. Not the real one. But made of marzipan! I could pretend for all I care about me munching down two chillis, but no one would watch. They were cute, so very well crafted and an adoration on a plate! All in all, the festival is a good visit if you want to try out different chillies. However, I expected that a King of Spices festival would leave me red, gasping for breath and gulping down cold water, while absolutely enjoying the spread, given that it starred the Bhoot Jolokia. Don't expect that to happen. 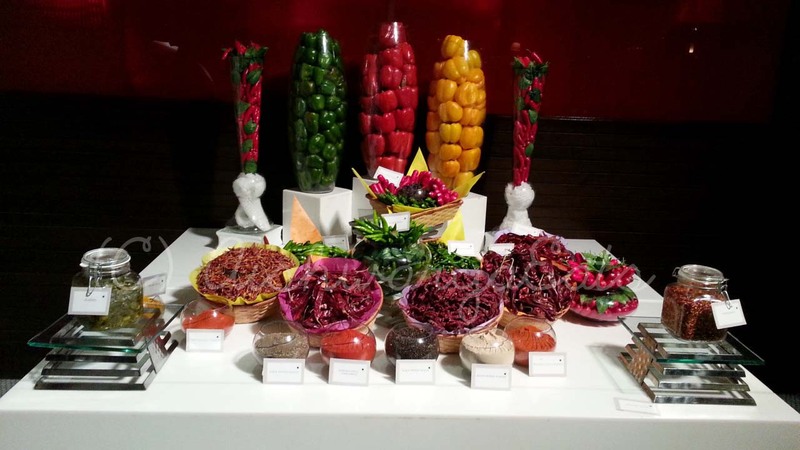 Expect good food, a watered-down experience of all the chillies, incredible presentation and a lot of fun.